Burnley Football Club has today announced that James Tarkowski has signed a new four-and-a-half-year deal to further commit himself to the Clarets. The defender’s new contract, which runs until June, 2022, replaces his existing deal which was due to expire at the end of next season. Tarkowski, 25, joined Burnley from Brentford in January, 2016 and made four appearances as the Clarets won the Championship title at the end of his first season at Turf Moor. The former Oldham Athletic centre-back then made 19 top-flight appearances as Sean Dyche’s sustained their Premier League status in 2016/17. Just four of those were starts, but following the departure of Michael Keane to Everton last summer, Tarkowski has enjoyed an outstanding run of form as Ben Mee’s central defensive partner in a Burnley side which achieved its highest half-way placing in the top flight since 1973. 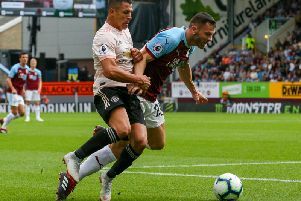 Tarkowski was an ever-present for the first 18 games of the season before picking up a retrospective three-match ban and sustaining a broken hand in the Clarets’ 0-0 draw at Brighton – where he helped Burnley keep a ninth clean sheet of the season – on 16 December. Following successful surgery, Tarkowski then returned to action for the New Year’s Day game against Liverpool and will now remain a key part of Dyche’s squad and a Burnley player for the foreseeable future.